Supermax is a rather nice name for a stock. If you use your mobile phone to type this word it might come out as superman. Anyway I digress. 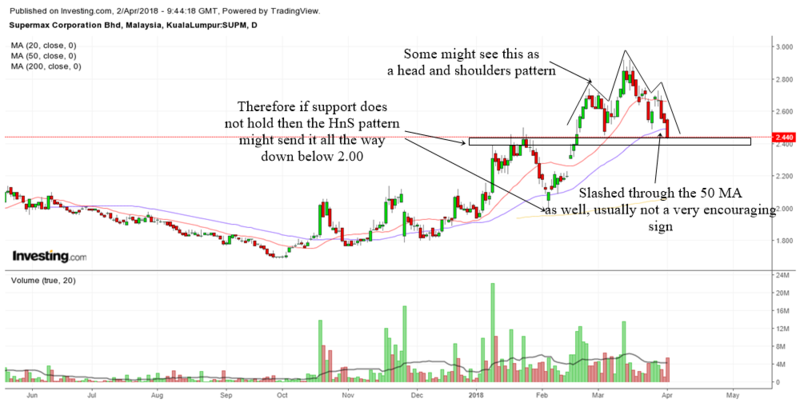 In this article we will use technical analysis to analyze what the price of Supermax is doing and to see what it is telling us. If I'm not mistaken this company just reported earnings. So the question for investors would be, should I buy more of it? Well, I leave the fundamentals to experts. But on a technical side, the stock is attempting to breakout of a small ascending triangle type of pattern. However, I would have more confidence if the stock can break above the downtrend line that I have drawn. There is a reason why stocks that break a downtrend line are strong. Breaking a trend line tells us the stock wants to start a new uptrend. And as traders and investors, you want to buy an uptrending stock. Looking at this stock, I'm glad I could see a buy setup in the form of an ascending triangle back in November. A proof that if you are observant, a stock may give you a short term trading opportunity. There is an overhead resistance above which I have highlighted in red but I think the recent rally in November would have help to absorbed the supply there. So if the stock can break above the recent downtrend line and start a new uptrend, I think the stock can move higher above the 2.20 price. The chart above is the weekly chart of Supermax. It's just possible that there is a weekly triangle forming. 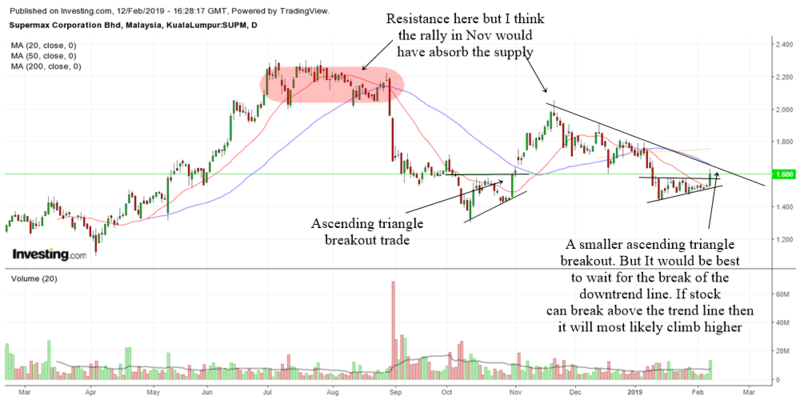 A breakout will help send the stock higher. Traders can also look at the lower trendline as support for the stock. As long as the stock does not go below the lower trend line then it will eventually move higher. 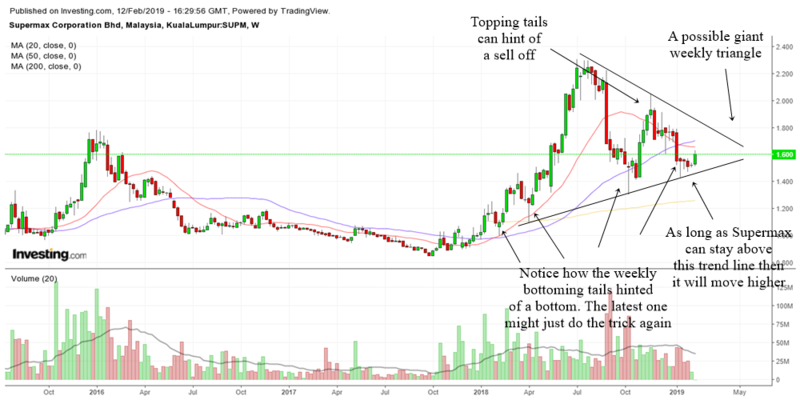 I'm amazed at how bottoming tails and topping tails in the weekly chart of this stock help to spot reversal. In fact they are trading opportunities as well. Finally, the chart above is the monthly chart of Supermax. The green area I have highlighted are past highs which have been overcome. True to the technical principle of resistance once overcome can become support, the stock has managed to find support at this area. 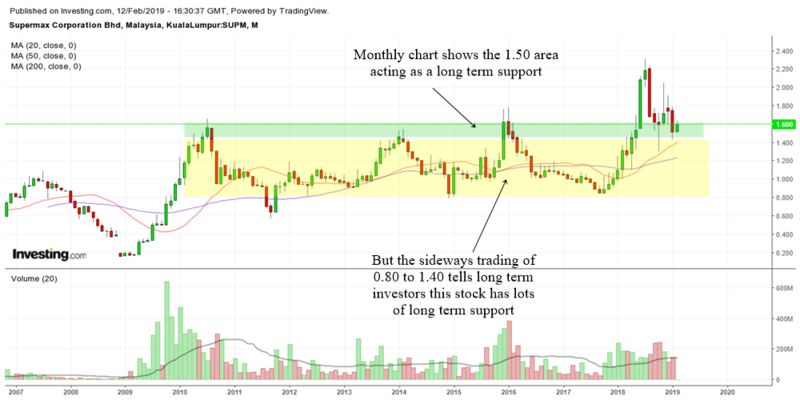 The long term sideways trading range of 0.80 to 1.40 which I have highlighted in yellow also tells long term investors that this stock has lots of long term support below. This gives the investor the confidence to hold on to this stock longer. I will try my best to give you a big picture, small picture and bird's eye view of the technical situation with regard to Supermax. What to do will ultimately be in your own hands. We shall begin with a daily chart analysis of the stock. The chart above shows the daily chart of Supermax. At this moment, the picture that it paints is not very rosy. Some people might see a head and shoulders top in this stock. It has also slashed below the 50 MA which is usually not a very encouraging sign. There is support at the 2.40 area and hopefully the support holds. If not, the stock might drop all the way to 2.00 if we use the head and shoulders top pattern. The 60 min chart currently tells us that it is in a downtrend in the 60 min. With it below the 60 min 20 MA and 50 MA, this is not a very healthy sign and usually I do not want to touch this kind of stock unless it goes back above the MAs. In the past, the stock has also shown us or warn us of a correction. 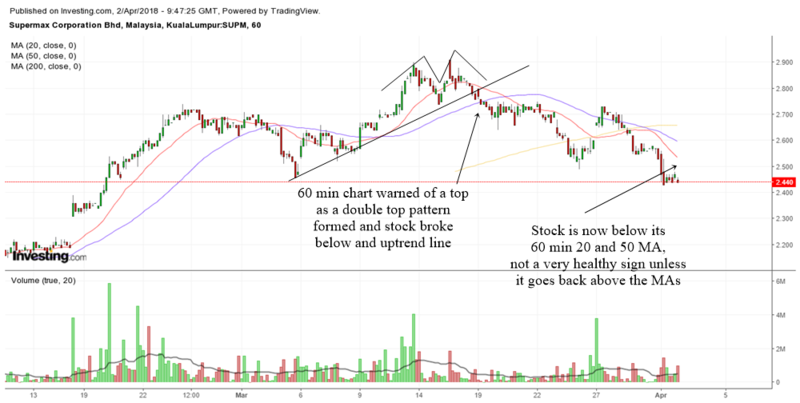 You can see how the stock formed a double top and also broke below a 60 min uptrend line. The breaking of the trendline started the correction. Well, the huge resistance and congestion area back in 2016 halted the stock's rise. Those resistance areas need to be absorbed which is why the stock collapsed right after forming a topping tail in the weekly chart. 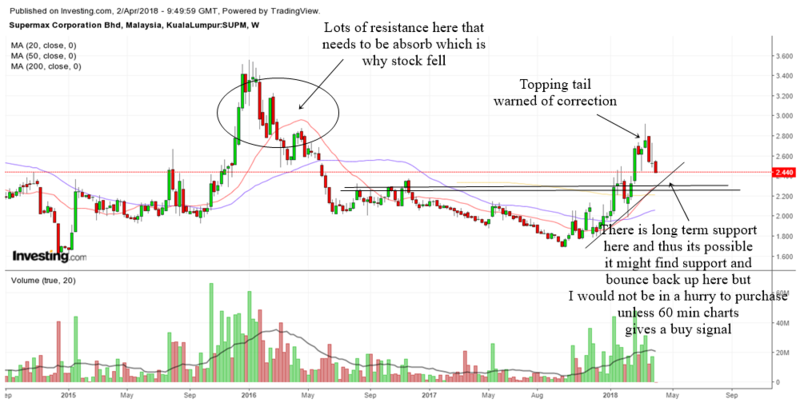 There is a long term support below which I have drawn and hopefully it might help to support the stock. I have also drawn an uptrend line. Perhaps the correction may stop there. But I wont be in a hurry to play this stock unless the 60 min chart gives me a buy signal.